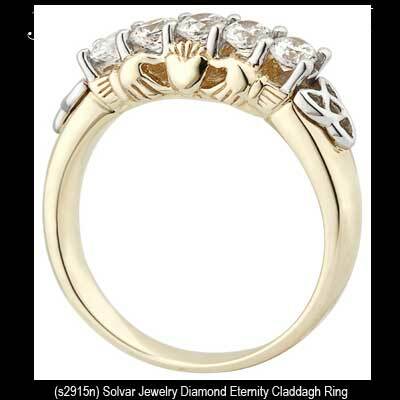 Diamond Claddagh ring is cast in 14K gold with an eternity design that is accented with Trinity knots. This diamond Claddagh ring in 14K yellow gold is in the eternity style with 5 solitaire diamonds. The total diamond weight on this Claddagh ring is 0.50ct (1/2ct) with a clarity grade of SI and a H - I rating on the color scale. The Claddagh symbol is present on both sides of the ring and there is a white gold accented Trinity knot on both sides of the diamonds. 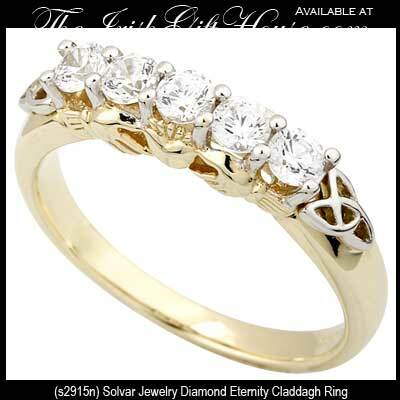 This Claddagh eternity ring is made by Solvar Jewelry in Dublin, Ireland and it is gift boxed with a Galway Folklore card that explains how to correctly wear the Irish ring along with Claddagh and Celtic knot history cards, complements of The Irish Gift House. 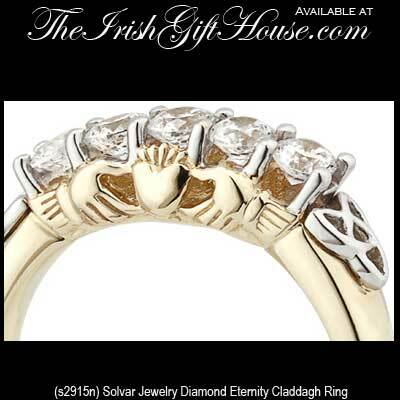 This diamond Claddagh ring is available in sizes 5 through 9 1/2, including half sizes.